My journey through the East End this week, as I strolled from the Royal Foundation of Saint Katharine in Limehouse to Liverpool Street Station, brought me along Commerical Road, and the former heart of the Jewish East End of London. Eventually I came to Fournier Street, formerly Church Street, an East End street of 18th-century houses in Spitalfields, and a street that has been home to successive generations of new religious refugees and immigrants, from French-speaking Huguenots in the early 18th century, to Jewish refugees from East Europe in the 19th century, to Bengali Muslims in the 20th century. 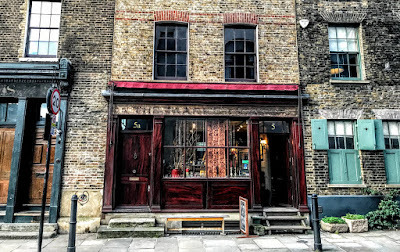 Fournier Street runs from Commercial Street to Brick Lane, from a church to a mosque. Its French-sounding name from George Fournier, a member of a family of Huguenot refugees. This was the last street built on the Wood-Michell estate in Spitalfields. It was developed in response to the settlement of a significant community of French Huguenots around Spitalfields after the revocation of the Edict of Nantes in 1685. By settling here, outside the bounds of the City of London, they hoped to avoid the restrictive legislation of the City Guilds. These Huguenots brought with them little apart from their skills, and an Order in Council in 1687 raised £200,000 to relieve their poverty. Many of these refugees brought silk-weaving skills from Nantes, Lyons and other French cities. The houses were initially built as domestic dwellings, but they were immediately turned to use for this new silk industry. The houses mainly date from the 1720s and they form one of the most important and best preserved collections of early Georgian domestic townhouses in Britain. Fournier Street was designed to be both well-appointed and of a higher standard than previous residential developments in the area. They were bought and leased by the master silk-weavers and silk mercers. These houses are notable for their fine wooden panelling and elaborate joinery, including carved staircases, fireplaces and highly detailed doorcases that were made by skilled craftsmen. Silk-weaving activities were carried out on the upper floors to gain the best light for the looms. This use explains unusual highly glazed lofts that are still found in these houses. The ground floor rooms often served as elaborate showrooms for the finished products. Christ Church Spitalfields was built at the west end of Fournier Street in 1714-1729. It was designed by Nicholas Hawksmoor, a former assistant of Christopher Wren, and the church is regarded as the highest expression of English Baroque architecture. But as the French weavers and their community prospered, they had their own religious needs, and a new Huguenot church, La Neuve Eglise, was built at the east end of Fournier Street in 1743-1744. After the decline of the silk weaving industry in London at the end of the Georgian era, the community moved on and the Huguenot church became a a Wesleyan chapel in 1809 and a Methodist chapel in 1819. At the west end of Fournier Street, on the corner opposite Christ Church, the Ten Bells public house has notorious associations with Jack the Ripper from the 1880s. The area was changing in character, and in time both Fournier Street and Brick Lane became the heart of the Jewish East End. There had been a small Jewish community in the East End for some time, and a large number of Jews from Eastern Europe and Russia arrived to Spitalfields in the 19th century. They developed into a thriving community, with new schools, cultural activities and businesses, including the Jews Free School and the Jewish Chronicle, the oldest Jewish English-language weekly newspaper in the world. In 1898, the Methodist Church at the east end of Fournier Street, built by the Huguenots as La Neuve Eglise in 1743-1744, was converted into the Maz’ik Adath Synagogue, or Spitalfields Great Synagogue. One new community of religious refugees had given way to another. In recent years, the famous residents of Fournier Street have included the artists Gilbert and George, who lived and worked on the street for many years, and today the street has some of London’s finest Georgian houses. Weavers lived in the house at No 5 Fournier Street until about 1820, before two doctors, a father and son, moved in. They lived there for 50 years until the 1870s and built what is now the rear gallery as their surgery. A succession of people and businesses followed including a Russian translator, a furrier, coffee rooms and storage for the vegetable market. At the end of World War II, this became the Market Café, where Gilbert and George breakfasted for many years. 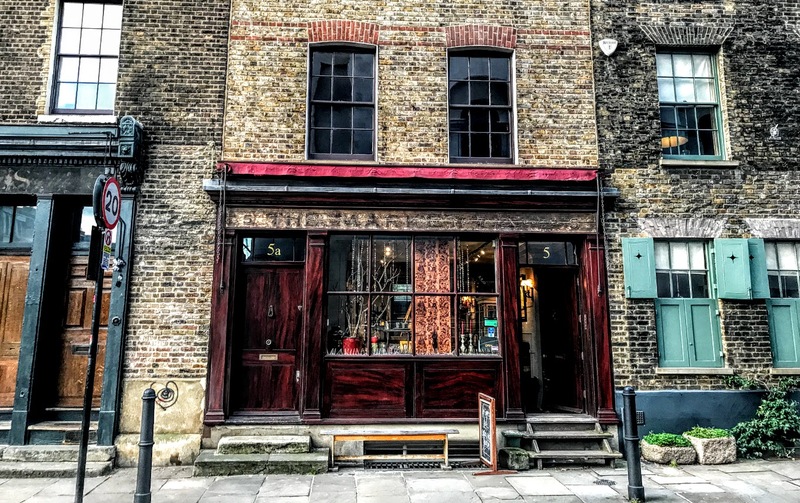 No 5 remained the Market Café until 2000, when Fiona Atkins, a long-time resident of the East End, bought the house, which was then run down and in need of repair. Today, No 5 is part museum, part gallery, part guesthouse and part shop, selling antique furniture and upholstery alongside a mix of locally sourced artefacts and objects. A kitchen in the basement area sells old china, glasses, serving dishes, colourful modern pottery and coffee and cake. At the back of the shop, the gallery – in what was once the doctors’ surgery – hosts regular exhibitions by contemporary London artists. No 5a Fournier Street fuses original Georgian features with 21st century comfort. The property can accommodate four adults, or a family of two adults and two children and includes two bedrooms, two living rooms and a modern kitchen and bathroom. One bedroom has amazing views of Christ Church Spitalfields and the City. It costs £600 for three nights. Howard House, a three-storey mansion at No 14 Fournier Street, was built around 1726 by William Taylor, carpenter and gentleman, for himself, but he later leased it to two silk weavers, Signeratt and Bourdillon. It is here the silk for Queen Victoria’s coronation gown was woven. The unique hardwood staircase balustrade is carved to display fluted columns with Ionic capitals placed on each turn for 100 steps, and each step is expertly carved with a masterly design of hops, barley, and wild roses. No 23 Fournier Street is one of the best surviving example of a classic, single-fronted early Georgian townhouse of simple but elegant design. Meanwhile, the surrounding area had evolved to become the heart of the Bengali community. In 1975, Spitalfields Great Synagogue was relocated to Golders Green, and in 1976 the building was reopened as the London Jamme Masjid or Great Mosque. A minaret was added to the building on the corner with Fournier Street and Brick Lane in December 2009. Damna tamen celeres reparant caelestia lunae; Nos ubi decidimus, Quo pater Aeneas, quo dives Tullus et Ancus, Pulvis et umbra sumus. The moons, however, quickly repair their heavenly losses; when we have fallen to where father Aeneas fell, and wealthy Tullus and Ancus, we are dust and shadow.